Having some issue with FPS and loading times. I need to assess some of my work, so I am revamping the route. Stay tuned. Updates are slow, but work is being done. In order to get quicker rendering, the number of faces must be reduced. 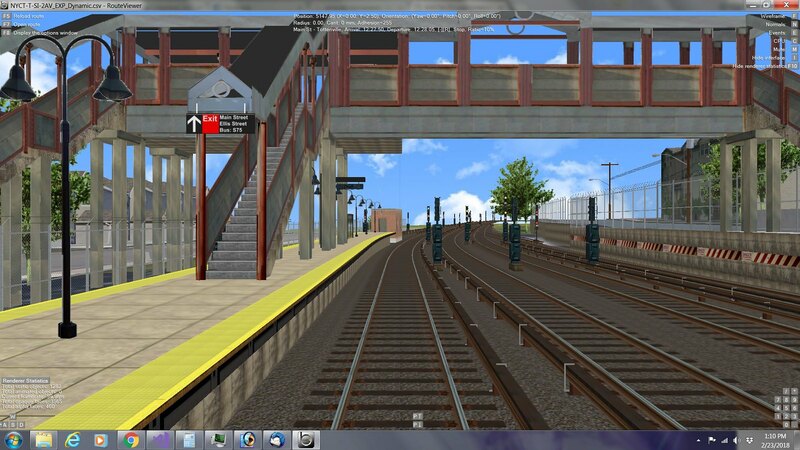 This image is of Girard Street in Tottenville looking towards the tracks. Originally this view which is is 25 meter section had 12000 faces. 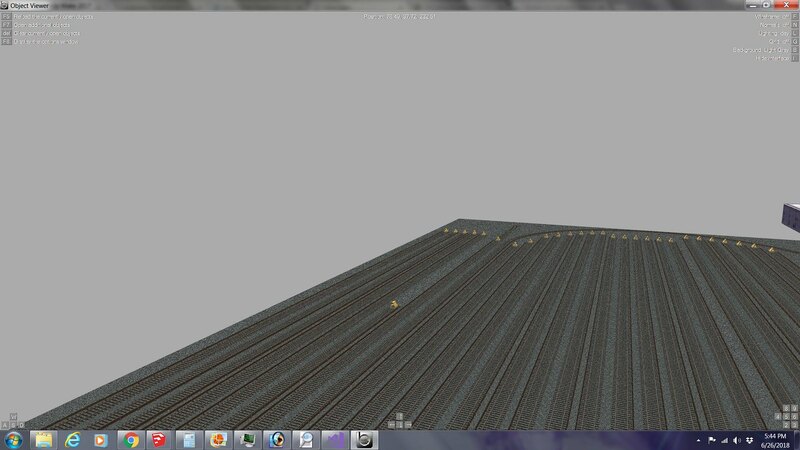 It now has only 2000 with better detail because the textures are image files rather than vectors. An automobile that once had 500 faces now has 25. A bus with 1200 faces now has 55. More textures have to be loaded, so I am not sure if there is a downside to that. Excellent work. Very good when it comes to scenery and track layout. Just make sure that most people can run the game. Your route wont gain much support if members are unable to play it. But very good work. Yes. That is why I am looking at it more closely. Sometimes a simple revamp of a .csv file used as a repeated image to reduce the amount of faces will be enough to render images quickly to make the game acceptable. It's long and tedious work. Hi, have a lot going on including my route update. I have decided to take a new approach. Building a route is tedious work, and depending on the complexity, development time could be very long. As with most of my hobbies, and even in daily life I tend to want to make things complex. My first iteration of this route was a learning process, and while my results were good there was room for improvement. My objects had too many faces, some objects used alpha channels, and I tended to scratch build objects instead of using image files. When I did use image files they were not sized using the power of 2 rule. Performance suffered. 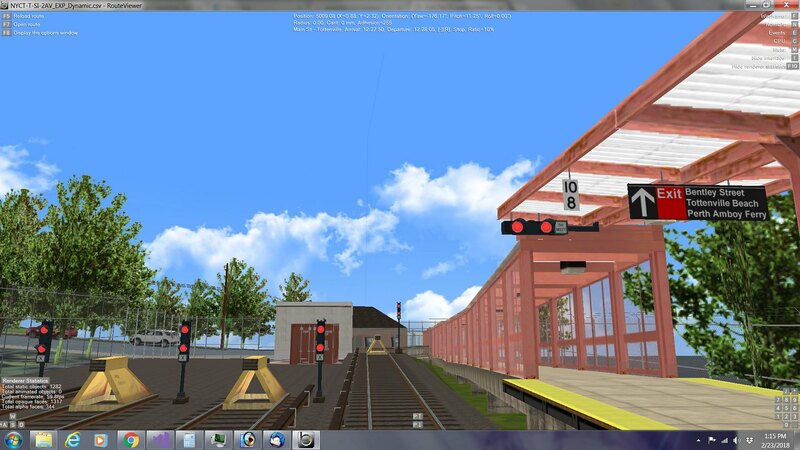 Use of PNG files for rendering objects such as stations, entrances, buildings, tracks, and signals. Using image files in combination with transparency drastically reduced the number of faces required by 90 to 95 percent. Image files are all power of 2 sized. Elimination of all alpha channels. Use of color matching for transparency. Over 500 signal combinations that are dynamically defined when needed using the preprocessor. Signals have two styles, round or shaped. The round combinations are finished. The shaped ones are only done for horizontal signals. Use of Google Earth to accurately pinpoint route location, surfaces, and buildings. Reduction in scenery from 500 feet on either side of track 0 to 250 feet. So far the results and rendering times have met or exceeded expectations. I will be absolutely sure when the route is done from station to station (to Arthur Kill Road). 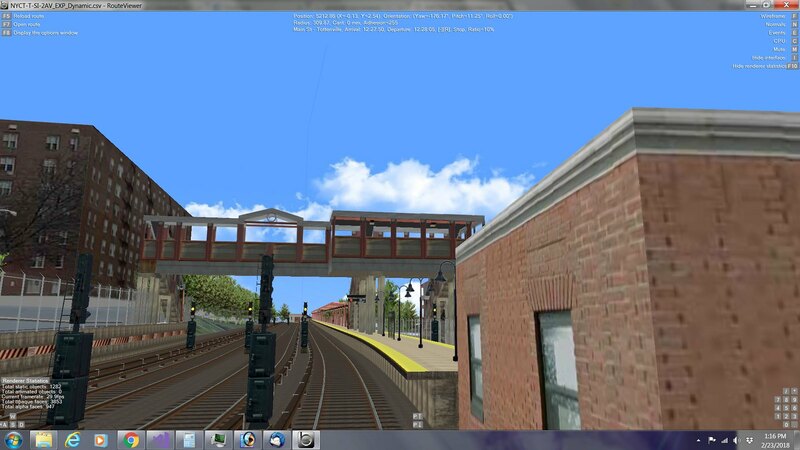 View from front cab waiting to leave Main Street - Tottenville. Yard signals to the right. All signals use round lens casings. Same view further back, perhaps from a shorter train. The current station overpass at Main Street needs to overlap the longer station required for subway trains. The curve also starts before the station ends. Google Maps was used to iron out these details. Station entrance at other end. Station entrance from another angle. Tottenville now has a new apartment building. Staten Island is much more urban because of the subway. 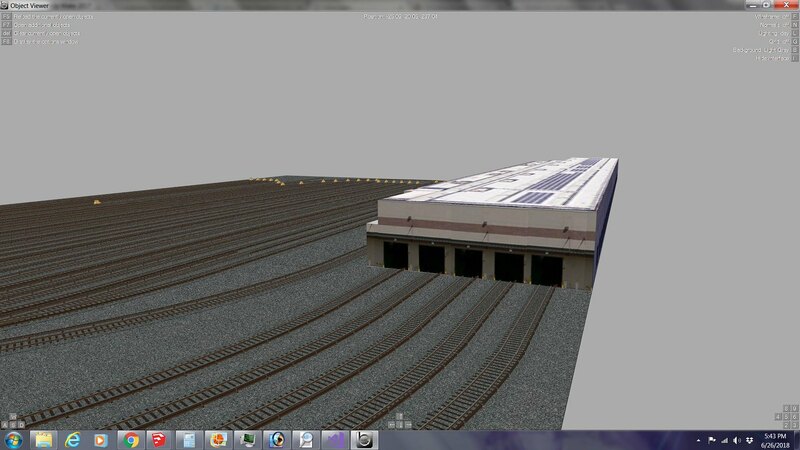 Reverse view showing end of the line and yard ends. Reverse view further down the track with station in view and yard entrance. More than halfway to Arthur Kill Road and performance is good. How is it possible that FPS is 100? 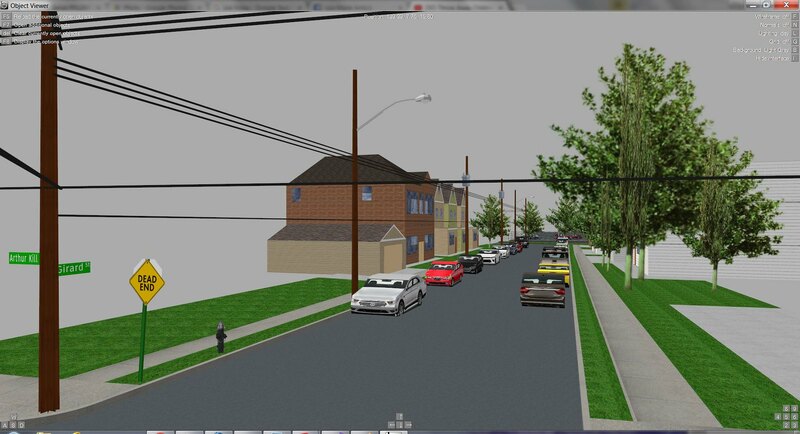 Also most of the surrounding scenery and objects are placed in ground objects built in SketchUp. When I get to Arthur Kill Road I will try reversing the route using these ground objects. Curves are tricky, but I have a method in mind to fractionally reduce or expand the size of the group in SketchUp containing the ground object depending upon the direction of the curve. 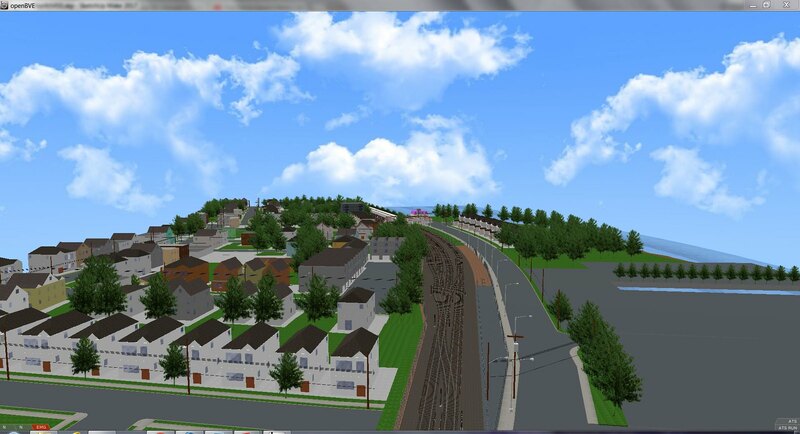 My work now consists of images from Google Earth and Google Maps Street View to give more realistic surroundings and buildings. 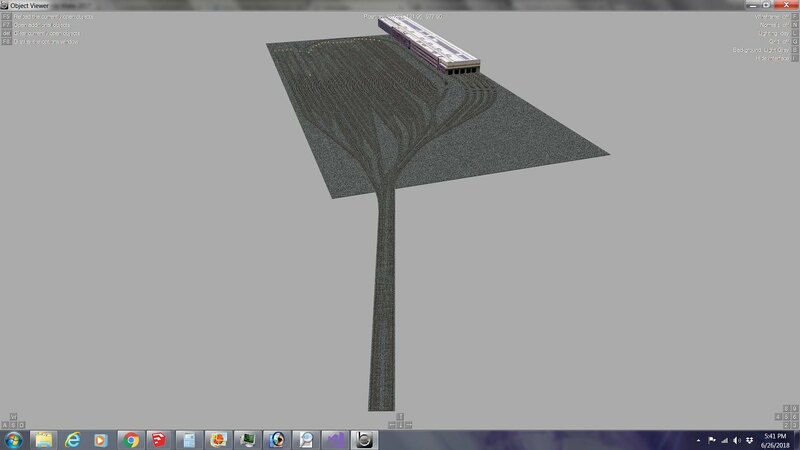 Also the reduction of detail from 500 feet to 250 feet on either side of track 0 delivers better performance. There is no need to add detail that will most likely never be used. The use of TRACK.GROUND builds the surroundings and not much use of TRACK.FREEOBJ. I would like some feedback on this. 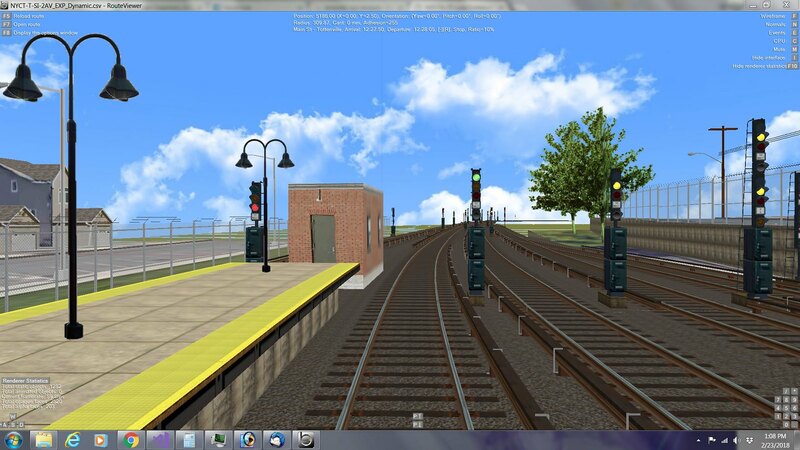 This route mixes fact with fiction and starts from Tottenville on the current SI Railway line. 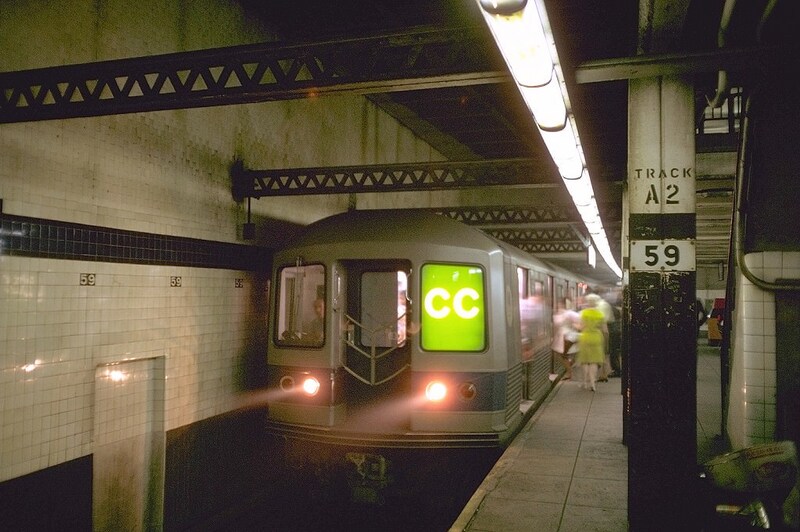 Currently the fiction is the reconfiguration of this route to subway standards such as signaling and longer stations. 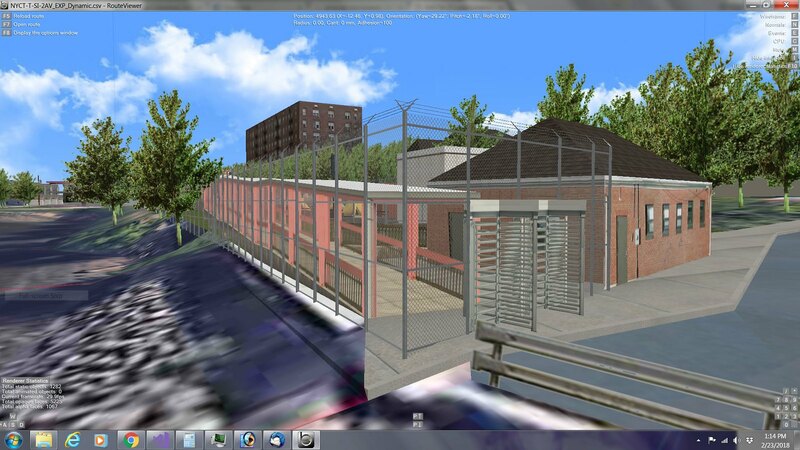 Additionally fictional apartment buildings and commercial buildings will be placed at strategic points, most likely in sparse areas to give a more urban look to Staten Island, as it would have been had the subway been extended there. The current aerial illustration has one fictional apartment house in the distance. Further along the route there are expanses of empty land between the stations of Arthur Kill Road, Richmond Valley Road, and Pleasant Plains. This area will be filled with high rise apartment houses and an overpass for Shore Front Drive, the proposed highway that would have cut across this area. 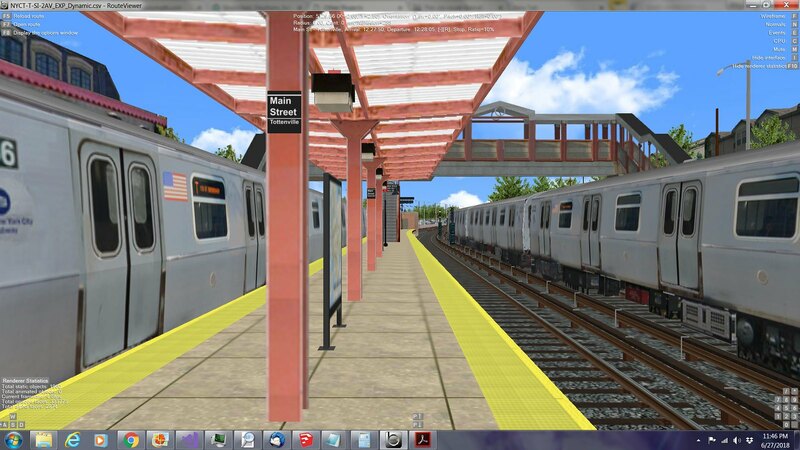 It is not out of the question that this fictional landscape would be a possibility had subways made it to Staten Island. 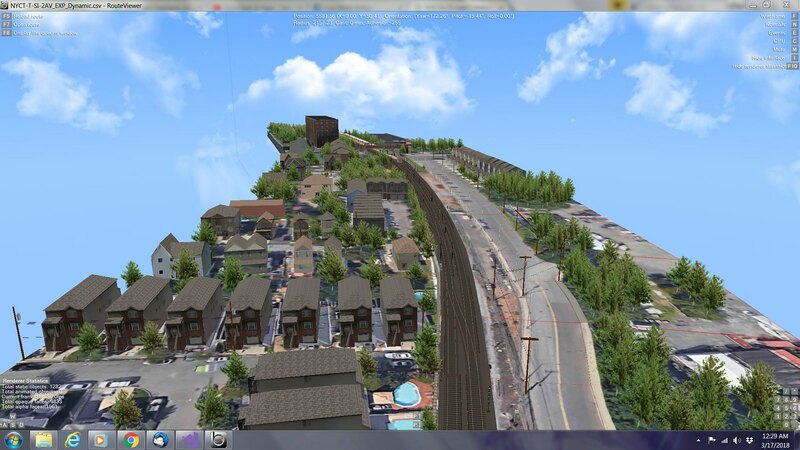 Check out the comparisons of the aerial views. Hi everyone. Its been a while, but I am still building. I am nearly at the Arthur Kill Station and decided to deviate a little. 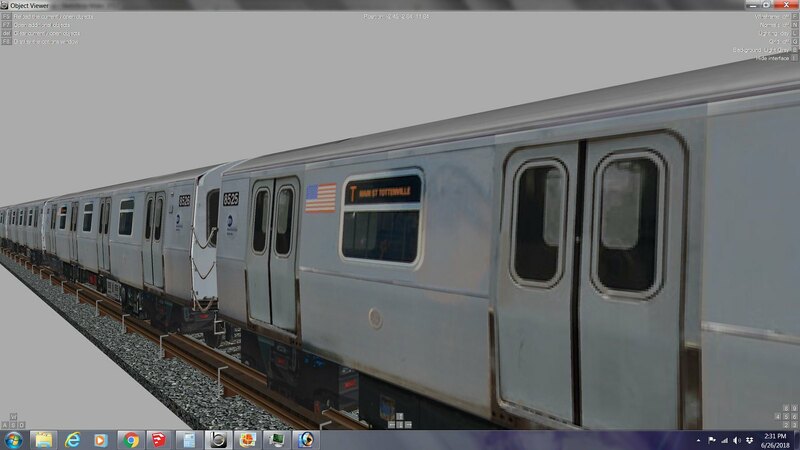 The T train must have a subway yard. The area bounded by Richmond Valley Road, Page Avenue, an the old Nassau facility is called Mill Creek. 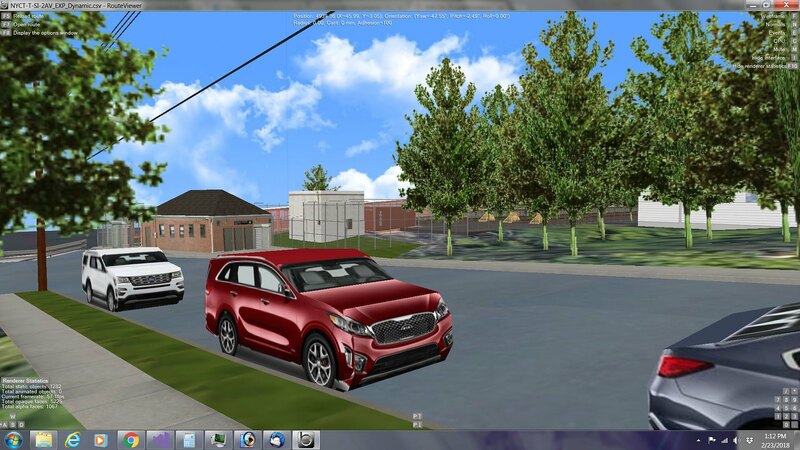 It is flat and an ideal location for a yard and maintenance facility. What I did was model a yard based on the Corona Yard. 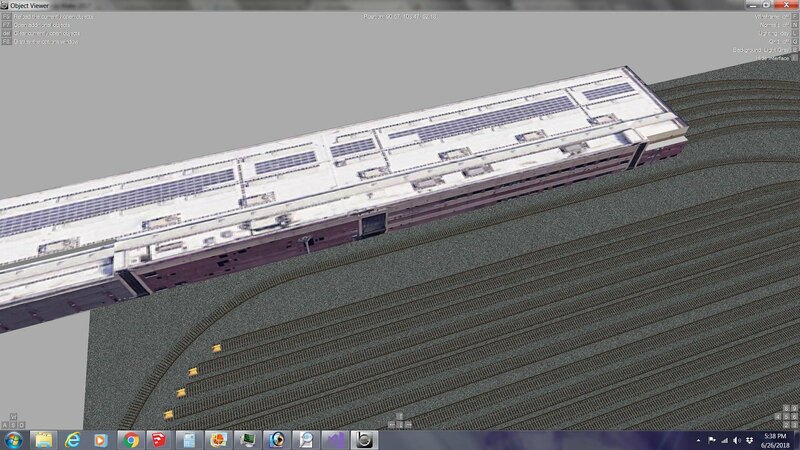 It will need to be broken up in slices to render properly. 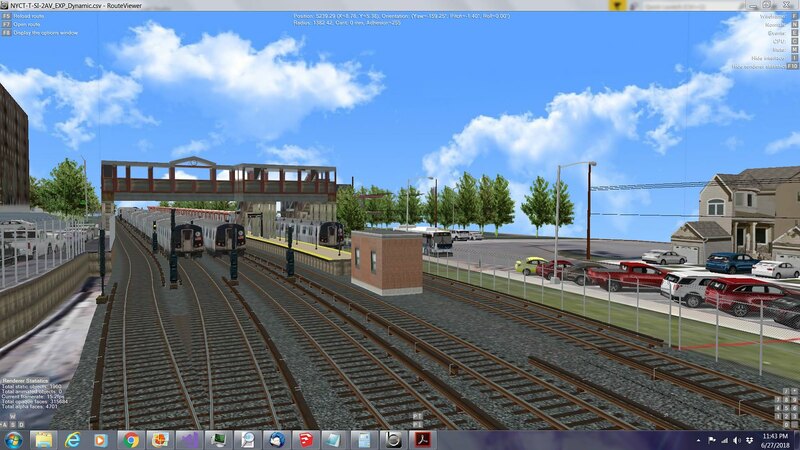 The yard is also home to the T train which uses the new technology trains R160 and R179. For testing purposes I drive using the R1. I wanted to build a train. This is my first attempt. Trains are configured as ABBBA, 10 car units. Car numbers 8525-8529 and 8692-8696 have destination MAIN ST TOTTENVILLE. Car numbers 8703-8707 and 8804-8808 have destination 125 ST BROADWAY. Each individual unit has approximately 250 faces. 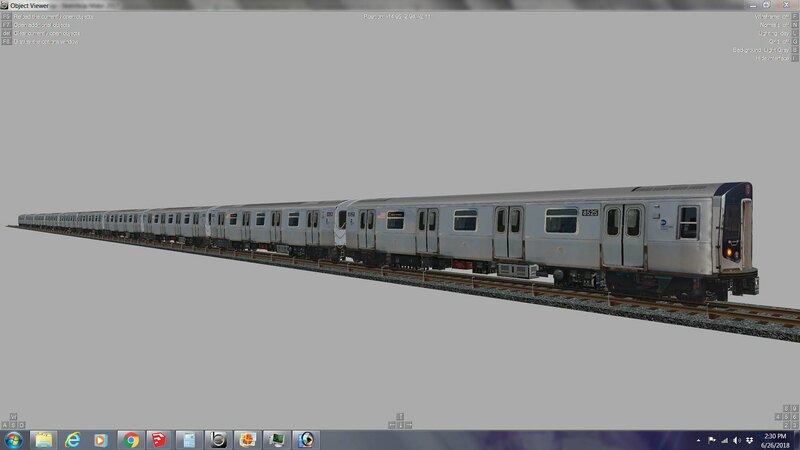 Shown here is a TOTTENVILLE train. Initially I attempted to build a yard using RAIL commands. That was nearly impossible. It was therefore built as an individual object which will be sliced up at 25 meter intervals. I have a dynamic signal generator which is a text file and uses include files to set parameters via the $Sub command. That text file is included in the loaded CSV file to run the game. I will use the signal generator to add signals to the yard. Furthermore I may build a train placement generator based on car identifier. Looking great, can't wait for the finished route. 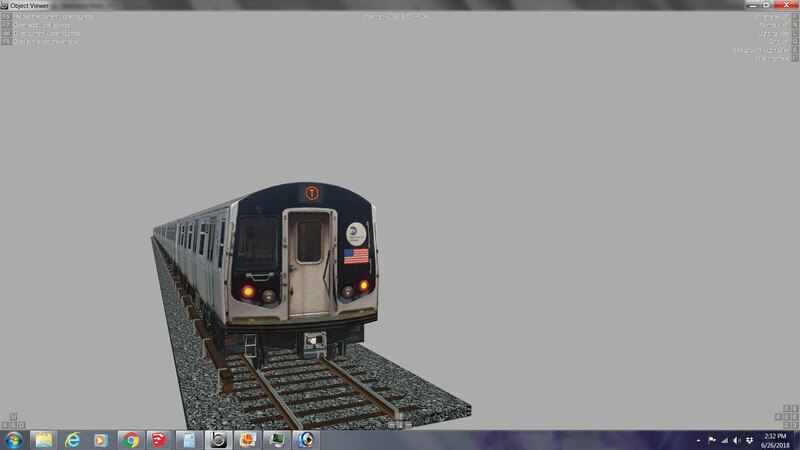 Trains in the Tottenville station and the small layup yard.